Jake Owen copped a brutal putdown from Phil Mickelson. PHIL Mickelson could soon be the subject of one of those confrontational country songs everyone loves. 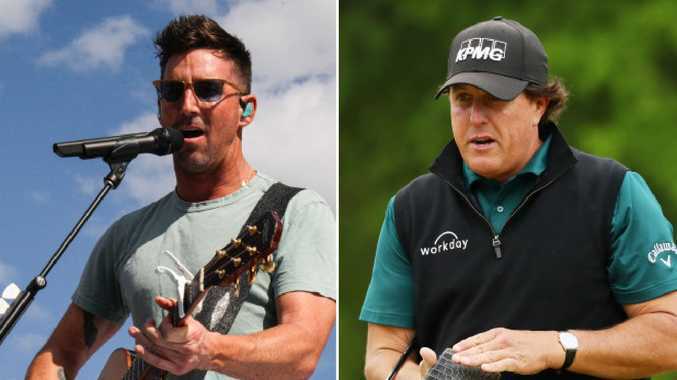 Lefty got into a verbal spat with country music singer Jake Owen at Jordan Spieth's wedding last November, apparently over Mickelson's pay-per-view match with Tiger Woods the previous day. Owen, who is close friends with Spieth, said on Barstool's "ForePlay" podcast Monday that he confronted Mickelson about getting a refund of the roughly $30 he and millions of others "wasted" on the lacklustre event many viewers ended up watching for free. "I was like, 'Hey, Phil, you owe me f - king $29.99 for wasting four hours of my life with the s - ttiest golf I've ever seen,'" Owen said. "' … I want my $29.99 back and apologise to me for some s - tty golf.'" Owen added that Mickelson replied by whipping out a stack of cash and handing him a C-note. "I won 90,000 of these yesterday. Take one of these and go f - k yourself," Owen claimed Mickelson told him. The three-time Masters champion tweeted Monday in response to a video clip of Owen's tale, "True story."